I’ve barely been home long enough to consider myself settled in, and I’m already trying to fit my life back into my trusted purple suitcase. Freshly graduated and full of hope and possibilities, I packed up my life and hopped on a plane to the United States. Having already spent a high school year there, it was great to get to see my friends again, to relax on the beach, spend some time reading and sketching under the palm trees of sunny California and just enjoying my first taste of complete freedom. It also provided me with the opportunity of working in the theatre again (shout out to my high school theatre teacher Mr. Holmes, you are the best!). It reminded me of a dream I had put on hold: Working in the film industry. Before I knew it, my days in the theatre and hanging out with friends, who I had missed for so long, were over. It was back to packing this temporary life into my trusted purple suitcase and flying back home to Weikersdorf, Austria, about an hour south of Vienna. The kind of quaint little village where everybody still knows everybody. I wasn’t ready for the life that would await me back home. So when the opportunity to travel to Australia with my mom for three months came around I jumped at it — plus, it’s Australia, who wouldn’t? Just like that, I had won more time to try and figure out what I wanted to do with my life. During my high school year in Santa Barbara, a place brimming with art, music, dance and movies, it was impossible not to dip my toes into the water a little. It was there that I completely fell in love with theatre. The feeling I would have being part of bringing a story to life was just indescribable. I knew I wanted to do that for the rest of my life. After studying in Santa Barbara for a year, I knew I wanted to work in the film industry. Flying back home and getting a job somehow felt like I would be putting that dream on hold permanently, and that just wouldn’t do. Getting a work permit for the USA was difficult, and trying to start in Hollywood seemed even more unlikely. So where else could I follow my passion? 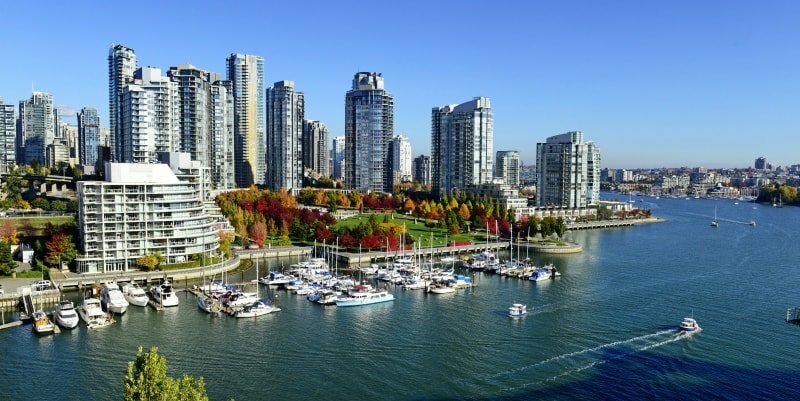 Almost all the TV shows I love to binge watch were shot in Canada, with filming in Vancouver particularly popular. So on a whim I looked up how my chances of getting a work permit for Canada were. Turns out, not bad at all. As a young Austrian, I was eligible under the International Experience Canada (IEC) program. So I started to research how realistic it would be to move to Canada, a country that I’ve never been to. And when I get there, how would I live there alone, without the support of family and friends close by, and find a job in the Vancouver film industry? Once I had all the information I needed to apply for the work permit, I sat down with my mom and told her about it. Like always, she was 100 percent on board. There weren’t any questions like ”but what if this or that happens? how would we even finance this? how would you even getting started?“. It was just pure excitement and encouragement. and exactly the last little shove I needed to send my application to Canadian immigration authorities. Goodbye small town Austria, hello big city Canada. Working in the Vancouver film industry is now my #1 goal. Now all I had to do was wait and break the news to the rest of family back home, who were still waiting to welcome me back from Australia. Not everybody in my family knows what to do with my need of traveling and experiencing different places on Earth. They don’t understand the appeal of risking a potential job or wasting years of my life to chase something that seems so unlikely (to them) and so far from home. I told my dad, who was perhaps not as vocally excited as my mom, but knew me enough to not be surprised. He wants me to chase my dreams as long as I’m safe and I know what I’m getting myself into. My dad is a quiet supporter. It’s nice to have him on my side. After two-and-a-half months of an interesting application process (more on that in my next blog) and waiting, checking my email account what felt like every five minutes, I received an email telling me I had been approved for a temporary work permit for Canada. There it was. The permission to follow my dreams nine time zones across the globe. Now it suddenly felt a lot more daunting. This meant I would have to tell the rest of my family, I would have to tell everybody, even my grandma’s cat,, that I’d be gone for a while. I had a few months to save money and plan everything. Talking about a dream that seemed far-fetched and actually acting on it where completely different things. Every time someone made comments about what I wanted to do, I just smiled politely and told myself: Just wait, you’ll see. I felt even more motivated by every doubt they had or every time someone tried to belittle my dreams. But now it was time to prove them wrong, to prove to myself that I could do this and wanted to do this — and it is terrifying. What if I don’t get a job? What would I tell everybody? How would I explain all the effort that will be going into this year? Would they be disappointed? Would I be disappointed? Could I handle the risk of failing at something for the possibility of getting closer to it? Something that I’ve wanted for so long? And all the things I’m leaving behind: a good job at a law firm in Vienna that I started six months ago to save money. A job that promised a good raise in the near future and an opportunity to take a little more responsibility. A workplace that was filled with people I now think of as friends, with exciting challenges every day. Something that I never imagined doing my whole life but somehow enjoyed now. I thrived on the feeling of being good at my job. I started to feel comfortable in the predictable future it could provide. Meanwhile in Vancouver, I don’t have an apartment, I don’t have a job yet and I don’t know a single person there. I’m leaving behind my best friend since childhood and my family. My aunt just had her first baby not even three months ago. I’ll miss his first steps, his first words. My mom and I started a huge redecoration process at our apartment and by the time it will be done, I’ll barely be able to enjoy it. It never gets easier leaving them, even knowing it’s temporary. A whole year of moments, celebrations that I wont be part of. But at the same time, it’s a full year of me working to make my dreams come true, to meet new people that will hopefully become friends and family, and enjoy experiences I would never be able to enjoy otherwise. There will be days when I may feel lost and alone. Days where I will question my sanity for ever thinking that I could do this alone. But I know that there will days that are going to make all the pain, sadness and frustration worth it. Moments where I will be on a set, hustling to run errands and get things done and I’ll pause for a second to take in the fact that I did it. I took a chance and got just the tiniest bit closer to my dream. I can’t wait for those moments. Nicole, 21, is moving to Canada with dreams of working in the Vancouver film industry. You can read more from Nicole’s blog ‘The adventures of the purple suitcase’ on Moving2Canada over the coming months. Follow Moving2Canada on Facebook and Twitter, where we’ll be posting these blogs as they are published.